[2015.11.28] 自由交流 贫富皆为 - 亚非拉 - ECO中文网 - Powered by Discuz! 1. IN DECEMBER, as a winter chill descends on the continental United States, temperatures in Puerto Rico often reach 30°C. Palm trees sway alongside the Spanish colonial buildings in Old San Juan; the blue Atlantic stretches to the horizon. Yet the economic outlook for America’s Caribbean dependency is anything but sunny. Its government owes $72 billion in debt, which it says it cannot repay. On December 1st the territory is supposed to make—and is almost certain to miss—a $354m debt payment. And that is just the first of a series of repayments that add up to $1.4 billion (or nearly 1.5% of GDP) due in December and January. 2. Politicians in Washington are scrambling for a solution. The island’s fiscal woes are in part the result of chronically bad budgeting. But they also stem from structural economic weakness. Bailing out Puerto Rico, which is self-governing but not a state, is not a popular option. Yet when any corner of America faces a deterioration in its long-run economic fortunes, the costs will end up being shared, one way or another. 3. For decades Puerto Rico, which is poorer than the mainland, enjoyed a special tax status designed to encourage economic development. From 1976 the income of some manufacturers was exempt from both federal and local tax. Investment poured in, notably in pharmaceuticals. But in the 1990s the tax break fell victim to efforts to balance America’s federal budget and was phased out. When it came to an end in 2006, the island sank into a deep and protracted depression. The economy has since shrunk by 14%. Employment is 12% below the peak of 2006. As the economy has withered, obligations to creditors have loomed larger. 3. Many Puerto Ricans have not waited for a recovery. More than 200 move to the mainland every day. Roughly 5m Americans of Puerto Rican descent live in the continental United States; 3.5m remain on the island. Its labour force has shrunk 11% since 2009. 4. 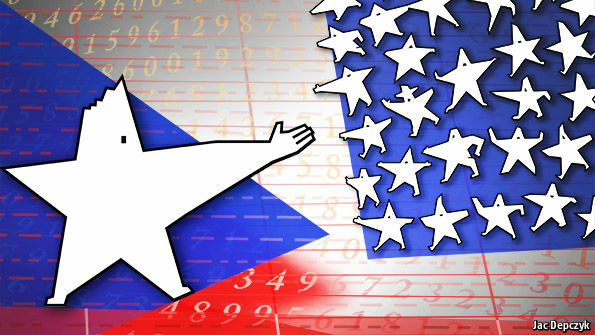 This migration to more prosperous places saps the Puerto Rican economy of potential, but it is precisely what economists think ought to happen when one region of a larger economy falls on hard times. At 5.7%, the unemployment rate in Detroit, a cash-strapped American city, is ten percentage points below the level of six years ago, when the car industry was in crisis. It would be much higher but for the shrinkage of Detroit’s labour force, which has contracted by about 5% since 2009. Between 2000 and 2014 about 90,000 Detroiters, or 2% of the population, moved away. In much of America’s industrial heartland, labour forces are shrinking. The migration of working-age adults away from struggling areas reduces joblessness. The country as a whole benefits as labour is drawn toward places that are on the up. 5. Migration reduces unemployment, but it cannot liberate struggling spots from accrued obligations—most notably pensions. Puerto Rico’s biggest government-pension programme has sufficient funds to cover just 0.7% of future obligations. State pension pots are not in quite such bad shape, but massive liabilities still loom. In Illinois, where the labour force has shrunk by about 3% since 2007, pensions are just 39% funded. Puerto Rico will not be the last local government to run out of money. 6. Perhaps for that reason, many politicians are adamant that the federal government should never rescue insolvent localities. Detroit, for one, was left to write down its debts in bankruptcy court. Puerto Rico cannot do that. The law bars states and territories from declaring bankruptcy, in order to deter profligate behaviour. That makes little sense when redistribution among states is already enormous. Because America’s tax system is progressive, rich states contribute much more per person to the Treasury than poor ones. Alabama and West Virginia routinely receive more than $2 in federal spending for each dollar they pay in federal tax; New York and California receive less than $0.70 on the dollar. Most of the redistribution comes in the form of programmes like Social Security (the national pension scheme) and Medicare (public health insurance for the elderly), for which average spending per person is not that different from one state to another. 7. During the financial crisis these handouts to poorer regions became even more generous. The federal government stood behind all American banks and borrowed to finance infrastructure spending and increased unemployment benefits. It also took in less tax, offsetting some of the pain of the recession. Indeed, America’s fiscal union is so good at absorbing shocks that it is often cited as a model for the more accident-prone euro zone. 8. The administration of Barack Obama has released a sensible plan to repair Puerto Rico’s finances. It would allow indebted government agencies, such as the island’s power company, to declare bankruptcy, and would provide for a restructuring of other debts and pension obligations. The federal government would also oversee the territory’s future public spending; as a sweetener, residents of the territory would gain full access to various anti-poverty schemes that are less generous there than on the mainland. 9. If Congress spurns this plan, Puerto Rico’s government will be forced to raise taxes to crippling levels and slash spending to pay its bills. That would hit the island’s residents, 40% of whom live below the poverty line, hard. It is difficult to imagine the federal government ignoring the humanitarian crisis that would probably follow. In addition, emigration to the mainland would presumably jump, initiating a vicious cycle whereby a shrinking tax base leads to rising taxes and curtailed services, prompting further emigration. As American citizens, the migrants will be eligible for public support of various kinds on the mainland. There is no question, in other words, that America will end up bearing much of the cost of Puerto Rico’s past profligacy. The only question is how considered and efficient its assistance will be. Bailing out Puerto Rico, which is self-governing but not a state, is not a popular option. Yet when any corner of America faces a deterioration in its long-run economic fortunes, the costs will end up being shared, one way or another. Employment is 12% below the peak of 2006. GMT+8, 2019-4-21 04:11 , Processed in 0.053329 second(s), 28 queries .